Prime Minister Narendra Modi and Japanese Prime Minister Shinzo Abe on, 14th September 2017, laid the foundation stone in Ahmedabad for India’s first bullet train project, connecting Mumbai and Ahmedabad. 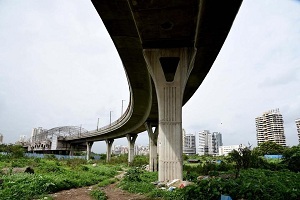 The Mumbai-Ahmedabad High Speed Rail Project will entail an estimated cost of Rs.1.10 Lakh Crores, thus, by far the most expensive transit project in India. The 508-km stretch will have 468 km of elevated track, 27 km inside tunnel and the remaining 13 km on the ground. The distance of 508 km will be covered in two hours and seven minutes. According to railway ministry officials, the operating speed of the bullet train will be 320 kmph and maximum speed will be 350 kmph. The High Speed Rail Corporation of India Ltd (HSRC) has already planned for five more high speed corridors including a Diamond Quadrilateral (Delhi-Kolkata, Delhi-Mumbai & Mumbai-Chennai). After the metros, the high speed corridor is the next big thing in the Indian mass transit system. Currently there are 10 operational metro systems (also known as mass transit systems) in 8 cities in India covering a distance of 370 km. A further 520 km of lines are under construction. In May 2015, the union government approved the Union Urban Development Ministry’s proposal to implement metro rail systems in 50 cities. The majority of the planned projects will be implemented through special purpose vehicles, which will be established as joint ventures between the Union and respective State Governments. The Union Government will invest an estimated ₹5 Lakh Crore (US$78 billion). 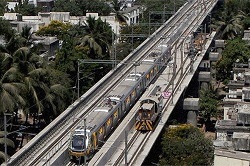 In August ’17, the central government approved a new metro policy, according to which, the metro rail projects will be approved and aided by the Central government only if there is private participation and the projects ensure last-mile connectivity for commuters. The policy allows the respective states to formulate rules and regulations and it empowers them to establish permanent fare fixation authorities. This opens up multiple avenues for investment by private players in mass transit systems. In all the metro systems which are operational in India, we have different security agencies providing security cover. It’s pertinent to mention here that metro systems across the globe are the second most threatened entities after the aviation industry. The level of security arrangements in all the metros in India are just secondary to airports on technical capabilities but when it comes to man guarding, barring DMRC, all the metros are secured by various private and state owned security forces with no unified command or well defined security regulations. 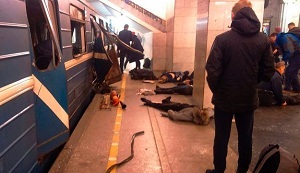 There have been multiple attacks on metro systems across the globe, the most recent was in April 2017 at Saint Petersburg Metro Train in Russia, where a briefcase bomb packed with shrapnel exploded on the train between Sennaya Ploshchad and Tekhnologichesky Institut stations. A total of 14 people were killed, and 64 were injured. While transportation security officials had been aware of the possible threat of terrorist attacks on transportation networks for some time, these tragic events exposed both vulnerabilities in security systems and the previously unimaginable consequences of such breaches. The extensive use of metro transit systems by many sections of the public makes them highly attractive targets for terrorists wanting to maximize panic and destruction. Accordingly, concerns about metro transit security rank high among metro authorities and transit passengers. The vulnerability of metro systems lies in the fact that they are very open and accessible, with fixed, predictable routes and access points. Their openness makes it easy for potential terrorists to mix in crowds without arousing suspicion. Securing such open and public systems presents a series of problems. The volume of passengers makes it impossible for metro operators to employ many of the security procedures used in aviation security. 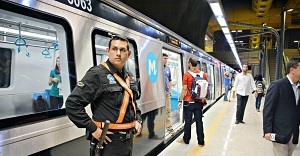 Preventive security measures on metros, such as the screening of passengers and luggage with X-ray scanners and metal detectors, hand searches, passenger profiling, sniffing dogs, and armed guards, lead to painful delays and costs. The need for metro operators to offer mass transit systems that are accessible, convenient, and affordable for daily users therefore conflicts with many security objectives. Attractive, convenient, public metro transit systems help to mitigate many of the problems of widespread auto/bus/local train use, and provide mobility for those who do not have access to cars, including the young, elderly, disabled, and poor. Therefore, balancing metro riders’ desire for convenience, accessibility, and affordability with security measures presents a challenge to transit operators. Security of mass transit systems is a global issue. Indeed, many transit systems around the world have been victimized by terrorists, including the metro systems of New York, London, Paris, Tokyo, Madrid, Saint Petersburg and Moscow. An analysis of terrorist attack trends indicates that their lethality has increased over time. In addition, the number of attacks against mass transit systems increased in the 1990s and 2000s. A 1997 survey sponsored by the Transportation Research Board (US) assessed both the perceptions of transit system managers regarding terrorism and security as well as the status of agencies’ existing emergency preparedness, planning, and response procedures. 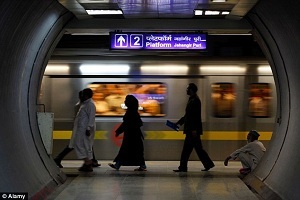 Metro systems ranked the highest in terms of the perceived risk as targets of terrorism. Detonation of explosive devices was perceived to pose the greatest threat to transit systems. International case studies of surface mass transit systems, mainly mass transit systems that have suffered terrorist attacks can offer examples of both vulnerabilities to terrorist threats, and effective measures for their prevention, mitigation, and response. Such case studies offer lessons on preparedness, response, and recovery that may apply to other transportation systems with similar physical and organizational characteristics. The existing literature on transit terrorism does not identify and compare the social and environmental characteristics of the mass transit systems that have been hit by terrorism, or the strategies that transit agencies around the world are adopting to offer protection to their riders. While intelligence systems have globalized rapidly in response to recent terrorist attacks, planning to prevent and mitigate terrorist attacks on transit systems is far more insular. Additionally, most research on transit terrorism has centred on the role of policing and technology in mitigating terrorist attacks. There has been far less investigation of how system design and public education may be employed to both reduce the likelihood of attacks and minimize the impact of attacks when they do occur. Public metro transit systems are an essential part of urban life. They are, by definition, open, dynamic systems that cannot be closed and regulated like the air transport system. The challenge is especially daunting given a growing wave of suicide bombers who are willing to risk capture or death to execute an attack. We must admit that there is an innate vulnerability to the system, and if you want to run an open mass transit system you live with the vulnerabilities and try to wrestle them through intelligence and stopping these people before they actually get in. At the very least, they reflect formidable challenges to security planning for open, accessible transit systems. Given the varying roles and mandates of agencies of the central government (MoUD & MHA), security agencies, intelligence services, police agencies, and metro operators on matters of security, close coordination and cooperation are critical to effective metro security planning. There is a need for a multi-layered and multipronged system of security in which various agencies play different roles. The mass transit industry, because it’s public, needs to be very mutually supportive. Resilience is about coordinating and facilitating efforts of all the disparate agencies to ensure better quality of performance, aiding and leading to a more effective prevention or recovery than might otherwise be the case. An important benefit of improved coordination is standardization of security protocols, security technology, emergency training, security audits, and disaster preparedness procedures, and the issuance of common guidelines about security. While the airline industry has adopted common international security standards and procedures, many other modes—and in particular metro transit—have not done so. While many transit agencies typically operating in larger municipality areas have planned to develop reciprocal integrated fare (like national common mobility card – More developed by MoUD) and passenger information protocols, efforts to integrate and standardize security practices and procedures among metro systems in our country are relatively new. Standardizing safety guidelines and signage, the structure and content of security announcements, and the marking of emergency exits on trains and in stations can all help passengers avoid confusion in times of emergency. Likewise, standardizing security training of personnel—drivers, supervisors, and managers—can improve coordination with police, fire, and intelligence officials in times of emergency. The role of Crime Prevention Through Environmental Design (CPTED) in security planning is growing. The importance of CPTED—which considers how the physical design of spaces can affect both the likelihood and impact of criminal or terrorist activity—as an important longer-term strategy to address both crime and terrorism on mass transit systems has to be understood by the planners. This classification of effectiveness is similar to both policing and security hardware and technology strategies, and well ahead of public education and outreach. Security is based on prevention, and prevention begins with design. A station designed without security criteria would be much more insecure and expensive to protect. Hence it’s imperative to bring on board security expert(s) during the making of the detailed project report (DPR) and should be made part of the project planning and execution. Terrorist attacks on transit systems have increased in recent years in both frequency and severity. However, metro passengers remain far more likely to be victimized by petty crime than a terrorist act. Further, studies have repeatedly shown that fear of crime is a significant deterrent to transit use for many people. So while political attention and public resources are currently focused on transit terrorism, reduction of personal and property crimes on public transit systems could prove to be a significant collateral benefit of safer, more secure public transit systems. Coincident with new security measures on the Tokyo Metro, both robberies and thefts are down substantially. 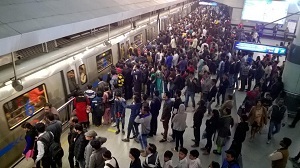 Delhi Metro is planning to deploy security staff in plain clothes inside metro coaches to counter pick pocketing, harassing and other petty crimes. Likewise, fewer crimes were reported in the period following the implementation of random parcel inspections in Madrid. Such complementary benefits, however, are not assured without careful attention to congruency between anticrime and antiterrorism measures which worked very much hand in hand. It’s easier for a terrorist to operate in an environment that is disorderly, that does not give the appearance that someone is in charge; and the area does not look secure. Actually taking care of the little things, and insuring that there is order and maintenance, sends a signal that it’s hard to operate illegally or carry out an attack in this environment. This creates a deterrent effect. ⦁ Planning, Designing, and Construction: It is imperative to incorporate into the planning and physical design of a metro transit system the best current knowledge of terrorist threats, thereby minimizing through system design the probable damage by incidents that could happen at any time, even years later. The choice of materials for the construction of stations and trains, for example, should be made on the basis of full consideration of terrorist attacks; the provision of ventilation systems should include considerations of fire suppression, anthrax, and possible chemical attacks; the selection of computerized communications, CCTVs and control systems should be informed by their potential vulnerabilities and maximize their ability to continue functioning under difficult circumstances, and facilitate responses by emergency personnel. ⦁ Incident Response Mechanism: The vulnerability of metro transit systems to terrorist attacks should be reviewed periodically throughout the operational life of a metro transit system so security officials can refine planning in response to evolving threats. For example, interagency cooperation should be encouraged and staff training should be updated. Sufficient information also must be provided to passengers so that, in the event of an incident, they will know how to respond. In addition to the actions of metro transit operators and their funding agencies, police and intelligence efforts by local security agencies charged with counter-terrorism should be ongoing. If and when an incident occurs, the immediate response—including clearance, search, rescue, recovery, and the restoration of service—constitutes a critical stage. While these actions may last only a few weeks, they provide invaluable information for security planners. As terrorist incidents are such infrequent events, deconstructing the role of system design and operations in worsening or minimizing the effects of the attack can be used to help plan and operate safer public metro transit systems in the future and provide for continuity of operations in emergency situations. ⦁ Long-Term Recovery: The final stage in responding to a terrorist incident may last for years, and constitutes the redesign, reconstruction, and operation of the system under new rules and procedures that are influenced by the incident and what has been learned during the planning and rebuilding process. This stage also involves restoring public trust in the security of the transit system.